Last week I attended my first ever yoga class. It was interesting. When I got there the lights in the room were dimmed and two ladies were on yoga mats in the back of the class. They had removed their shoes and were laying there sort of stretching/sort of relaxing. I followed their lead. When my friend Airplanes got to class she whispered questions to me. I jokingly said, “huh? … HUH!? …” then loudly, “WHAT? !” Airplanes told me that in some classes you don’t speak at all. Whoops. The class had about eight people in it, about half the class was in their 20s/30s and the other half 50s/60s. And I was the only guy. The instructor came in and began some crazy talk about the Earth and the Sun and what have you. I was hopeful I would hear a lot of crazy and would be entertained by it, but it was just a steady dose of mildly crazy. Hippy-light. She was good at the soothing tones, but a few things stuck out as funny to me. One of the poses we did was called the Cow. Another, the Cat. For those you pose like you’re a parent and your kid wants to ride a horsey and you are that horsey. So saddle up, buttercup! Then for the cow you do … something … And for the cat you do something else … I really don’t know what. She kept saying so many things so quickly, “inhale and bring your navel to your spine and raise the crown of your head and your navel is at your spine and you’re relaxing and now bring your tailbone UP … and you’re exhaling and …” Meanwhile I would’ve taken ten breaths during this time period. Was I expected to breathe in and hold it for that long? That’s insanity. To help us with the cat posed she told us to picture an angry cat, how their spine is arched, and we can be that angry cat. Come on … How’s that not funny? A woman in her 50s walking around whisper-telling you to be an angry cat? That’s fantastic. Now imagine this with someone whispering to you how to be more fetal. For just about every move (except the one where I laid flat on my back), I felt like I was doing things wrong. But the instructor only corrected me twice. Let me tell you, that’s a weird thing to have whispered to you. The other time I was corrected was when I messed up the fetal position. We started by laying flat on our backs, then raising our knees so our feet were flat on the ground. Then we put the right arm out, and slowly moved our hip to put the knees to the ground on your right side. Throughout class, unless it was impossible, I would try to look at the instructor or other people to see what I should be doing. I raised my head to make sure I was doing everything right (because the idea that we would just lay in the fetal position was weird to me, so I thought maybe it was some kind of Yoga variation on the fetal position … nope). Right when I raised my head the instructor happened to be beside me, she leaned in close and whispered, “put your cheek on your bicep … and your left hand by your heart.” I put my head down and grinned like an idiot. 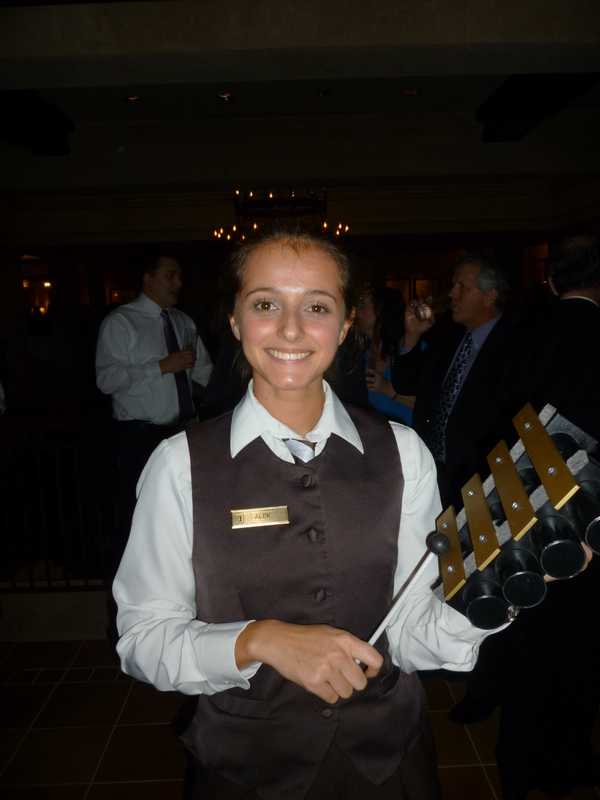 I went to a fancy wedding and a girl actually played this mini-xylophone type thing. I giggled and asked to take her picture. I had been drinking. With just a minute or two left in class the instruct got out a little bell and rang it. The noise filled the air. I thought maybe there was going to be some door opening up and a hoighty-toighty dinner would be waiting. But nope. Everyone else continued to lay there peacefully so I followed suit. Apparently a ringing bell is an indication to keep doing exactly what you had been doing. If you haven’t done yoga and this is your first exposure to it … I’m sorry. This is a terrible introduction. Give it a whirl, but don’t expect much if you’re as inflexible as I am. I think it could be a good workout, but next time I need to stretch out a bunch before class. I may look like Gumby but I’m nowhere near as flexible.